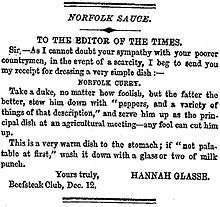 Hannah Glasse (March 1708 – 1 September 1770) was an English cookery writer of the 18th century. She is remembered mainly for her bestselling cookbook, The Art of Cookery made Plain and Easy, first published in 1747. The book was reprinted within its first year of publication, appeared in 20 editions in the 18th century, and continued to be published until 1843. Glasse was christened on 28 March 1708 at St Andrews, Holborn, London. Her mother is said to have been Hannah Reynolds, a widow. Her father was Isaac Allgood, a landowner of Brandon and Simonburn, both in Northumberland. He had recently married Hannah Clark, the daughter of a London vintner. She once described her mother in a letter as being a "wicked wretch!" During her childhood, Glasse formed a relationship with her father's youngest sister, Margaret Widdrington, with whom she corresponded through most of her adult life. The surviving letters are the major source of information about Glasse's personal life. On 5 August 1724 at Leyton, Glasse married an Irish soldier, John Glasse. [lower-alpha 1] Glasse's letters reveal that from 1728–1732 the couple held positions in the household of the 4th Earl of Donegall at Broomfield, Essex. Thereafter, it seems, they lived in London. Glasse's identity as the author of one of the most popular of 18th-century cookery books was confirmed in 1938 by the historian Madeline Hope Dodds. 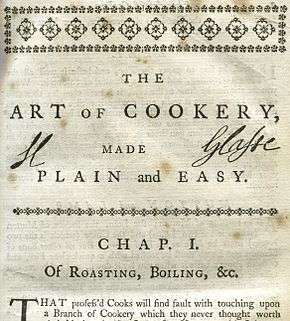 The Art of Cookery Made Plain and Easy was published by subscription in 1747, and also sold at 'Mrs. Ashburn’s China Shop' according to the title page. A second edition appeared before the year was out. The book did not reveal its authorship, using the vague cover "By a Lady". This permitted the erroneous claim that it was written by John Hill, for instance in Boswell’s Life of Johnson. Johnson was not convinced. In 1747, the same year in which the book appeared, John Glasse died. Also in that year, Glasse set herself up as a 'habitmaker' or dressmaker in Tavistock Street, Covent Garden, in partnership with her eldest daughter Margaret. In 1754 Glasse became bankrupt. Her stock was not auctioned after the bankruptcy, as it was all held in Margaret’s name. However, on 29 October 1754, Glasse was forced to auction her most prized asset, the copyright for The Art of Cookery. On 17 December 1754, the London Gazette stated that Glasse would be discharged from bankruptcy on 11 January 1755. In the same year, she and her brother Lancelot repaid the sum of £500 they had jointly borrowed of Sir Henry Bedingfeld two years before. Glasse once again fell into dire financial difficulties and was consigned on the 22 June 1757 to the Marshalsea debtors' prison. In July 1757, she was transferred to Fleet Prison. No record has been found of her release date, but she was a free woman by 2 December 1757, as on this day she registered three shares in The Servants Directory, a new book she had written on the managing of a household. It was not a commercially successful venture, although its plagiarized editions were popular in North America. Her daughter continued to pay the rates on the Tavistock Street premises until 1758, when it was listed as empty. In 1755 Ann Cook published Professed Cookery, containing a 68-page attack on Glasse. Cook lived in Hexham, and was reacting to an alleged campaign of intimidation and persecution by Lancelot Allgood. In the same year, Glasse published her third and last work, The Compleat Confectioner. It was reprinted several times, but did not match the success that she had enjoyed with The Art of Cookery. The London Gazette announced that "Mrs. Hannah Glasse, (half-)sister to Lancelot Allgood, died on 1 September 1770, aged 62". Glasse and her husband had eleven children, five of them surviving. The direction "First catch your hare" is sometimes misattributed to Glasse. The closest to it in her Art of Cookery is the recipe for roast hare (page 6) which begins "Take your hare when it be cas'd", meaning simply to take a skinned hare. In 1994, Prospect Books published a facsimile of the 1747 edition of Art of Cookery under the title First Catch Your Hare, with introductory essays by Jennifer Stead and Priscilla Bain, and a glossary by Alan Davidson; it was reissued in paperback in 2004. In 1998, Applewood Books published a facsimile edition of the 1805 edition, annotated by culinary historian Karen Hess. In 2006, Glasse was the subject of a BBC drama-documentary that called her the "mother of the modern dinner party", and "the first domestic goddess". Walter Staib serves Glasse's recipes in the City Tavern, Philadelphia, and praises her in his colonial cookbooks and his television show, A Taste of History. ↑ Prince, Rose (24 June 2006). "Hannah Glasse: The original domestic goddess". The Independent. 1 2 3 4 5 6 7 8 9 10 11 12 13 14 15 16 Clarissa Dickson Wright (2012). A History of English Food. Arrow Books. pp. 295–296. ISBN 9780099514947. ↑ Boyle, Laura (13 October 2011). "Hanna Glasse". Jane Austen Centre. Retrieved 28 July 2015. 1 2 Prince, Rose (24 June 2006). "Hannah Glasse: The original domestic goddess". The Independent. Retrieved 22 March 2015. ↑ Wood, James, ed. (1907). "Glasse, Mrs.". The Nuttall Encyclopædia. London and New York: Frederick Warne. ↑ Staib, Walter. City Tavern Cookbook: 200 Years of Classic Recipes from America's First Gourmet Restaurant, pp. 9, 212, Running Press, Philadelphia, London, 1999. ISBN 0-7624-0529-5. ↑ Staib, Walter. City Tavern Baking & Dessert Cookbook: 200 Years of Authentic American Recipes from Martha Washington's Chocolate Mousse Cake to Thomas Jefferson's Sweet Potato Biscuits, pp. 43, 49, 67, 99, 121, 137, 149, 171, 211, 217, Running Press, Philadelphia, London, 2003. ISBN 0-7624-1554-1. Wikimedia Commons has media related to Hannah Glasse. Extract of Art of Cookery from the British Library (and biographical information). Notes and excerpts from the text. Complete version of the Art of Cookery at Foods of England.